The exterior detail is amazing. All floor room heights are an impressive 255 mm high. A central staircase leads up to the first floor gallery. There is a rose window feature at the top of the central staircase with 3 full arch windows to add extra light to the impressive gallery. The ground floor rooms have solid double interior doors. All other rooms have 6 panel single doors. All rooms on the first floor have fully glazed opening French Doors leading out onto individual balconies with attractive railings. All windows are now manufactured using 3 mm thick material. Each window slots into a 5 mm rebate allowing you to now fit your own 2 mm glass. All floors have been grooved to a depth of 2 mm to allow you to fit your own hard wiring. 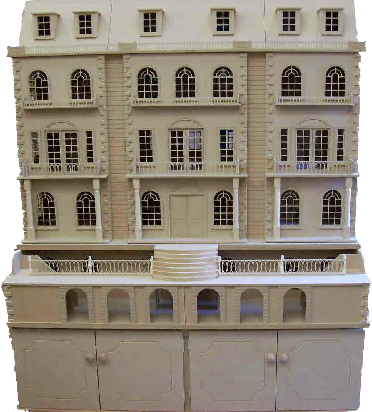 Please note: for ease of decoration, the windows, doors, dormers, internal/external moulding's, balustrade, window boxes etc, are not glued into place. Ashcroft Hall, basement and cabinet are delivered in 5 sections. 4 of these sections are 5 feet wide. We will deliver to your door in our own transport and where possible, set up the house where you want it sited. However, due to the size and weight, we WILL NOT carry this house up any stairs. It is your responsibility to ensure that there is reasonable access into your property i.e. through doorways. See our Delivery page.